One of our efficient HVAC offerings. High-efficiency equipment can help you reduce utility bill spending. Variable-speed motor technology provides a better mix of air, reduces hot and cold spots, and increases overall home comfort. Contains an energy-efficient motor that can help most air conditioners and heat pumps achieve peak efficiency. A high-efficiency gas furnace not only reduces the amount of money you spend heating your home during the winter, but can help maximize the efficiency of your cooling equipment. The FG7TE and FG7TN 96% AFUE gas furnaces contain iSEER® technology that promotes efficient cooling operation due to the energy-efficient motor. Additionally, this furnace acts as two furnaces in one due to two-stage operation – one stage operates in low capacity and one operates in high capacity. 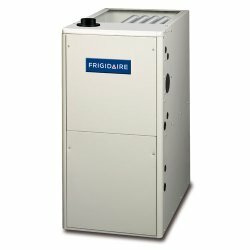 This increases home comfort and can reduce the amount you spend on home heating. These models go above and beyond ENERGY STAR efficiency standards, qualifying for a high-efficiency designation. Gas furnaces that include variable-speed technology reduce noise associated with operation, provide more consistent temperatures throughout a home and improve indoor air quality. The FG7TC-VS two-stage, variable-speed gas furnace is rated at 95.1% AFUE for money-saving performance. In fact, this model qualify for an ENERGY STAR high-efficiency designation. When you pair this model with most air conditioners and heat pumps, you can maximize their efficiency and all-around energy-saving performance. This furnace can be paired with our high-efficiency, iQ Drive® air conditioner or heat pump. At 95.1% AFUE, the FG7TC gas furnace offers money-saving heating performance. Two-stage operation allows the unit to act like two furnaces in one – one that operates in high speed and one that operates in low speed. This way, your furnace can act at an optimal performance level for your home at any given time – increasing home comfort and helping you save money. This model goes above-and-beyond ENERGY STAR efficiency standards for a high-efficiency designation in certain sizes and matches. Work with your contractor to come up with the right indoor/outdoor system pairing for maximum efficiency. The FG7TE-VS and FG7TN-VS two-stage, variable-speed gas furnaces provide exactly what you want from your central heating system – money-saving performance and maximum home comfort. At 96% AFUE, nearly all the energy that is put into the system is converted into heating power for your home. Plus, variable-speed operation enhances home comfort, reduces noise levels and improves indoor air quality. It can also help you maximize the cooling efficiency of your air conditioner or heat pump with its energy-efficient motor. At 96% AFUE performance, these models go beyond ENERGY STAR efficiency requirements – earning a high-efficiency designation. Homeowners looking to improve efficiency with a reliable heating system should consider investing in an FG7SC or an FG7SL 92.1% AFUE gas furnace. Not only does the insulated cabinet promote quiet operation, but it reduces air leakage and promotes efficient performance. These models are built to last using durable, proven components. This includes SmartLite® ignition technology that helps extend the life of the ignitor – one of the crucial components of your gas furnace. Plus, you don’t have to worry about placement – these models are available in multiple configurations to allow installation flexibility. Are you ready to upgrade to high efficiency? Models FG7SD and FG7SM are the ideal gas furnaces for budget-conscious homeowners looking to improve their home heating efficiency. At 95% AFUE, these models lose minimal amounts of energy up the flue. Nearly all the energy that is put into the unit is converted into heating power for your home. SmartLite® technology maximizes the lifespan of the ignitor, one of the most important components of any gas furnace. Additionally, it is checked 234 times at the factory to ensure that it is ready for your home.